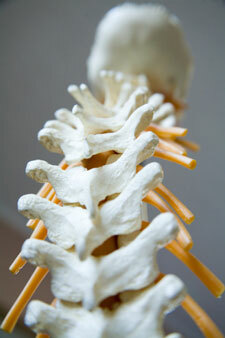 The cervical spine – that is, the upper seven of our vertebrae – is truly a wonder of nature. Its 37 separate joints endlessly allow the head and neck to move atop the torso – all the while obeying constant commands from the special senses and reflex mechanisms to help with balance and orientation. Look at it this way: the cervical spine allows us to move our heads all day long, while simultaneously providing bony protection for the spinal cord, spinal nerves and important blood vessels. The movement of the neck is achieved through the gliding joints on adjacent vertebra called facet joints. When the facet joints are working smoothly, the person has pain-free motion of the neck. However, the facet joints can become locked, due to injury, arthritis, poor posture and many other factors. This can cause painful movement, headaches or other types of local pain. In addition, spinal nerves exit from holes in the vertebrae and go to all parts of the body. For example, spinal nerves from the lower cervical spine extend into the arm and hand. Compression of the nerve in the cervical spine can cause pain, weakness or numbness into the arm and hand. Fortunately, chiropractors can correct problems of the cervical spine, all without drugs or surgery. These problems can include difficulty with range of motion of the neck, headaches, or pinched nerves. By making mechanical improvements to the facet joints, the chiropractor can improve range of motion, decrease irritation and inflammation and reduce pressure on pinched nerves. The result: you are back to being yourself again!